Here is a simply beautiful, elegant, easy to do dessert. Make these for your sweetheart or to impress your friends. 1. Rinse strawberries and cut off the very tip of the strawberry so that it will stand up. Remove the green top and scrape out a hole with a paring knife. . Prep all strawberries and set aside. 2. In a mixing bowl, beat cream cheese, stevia, and vanilla until creamy. Add cream cheese mix to a piping bag or ziploc with the corner snipped off or simply spoon it in with a small spoon. Fill the remaining strawberries with cheesecake mixture. 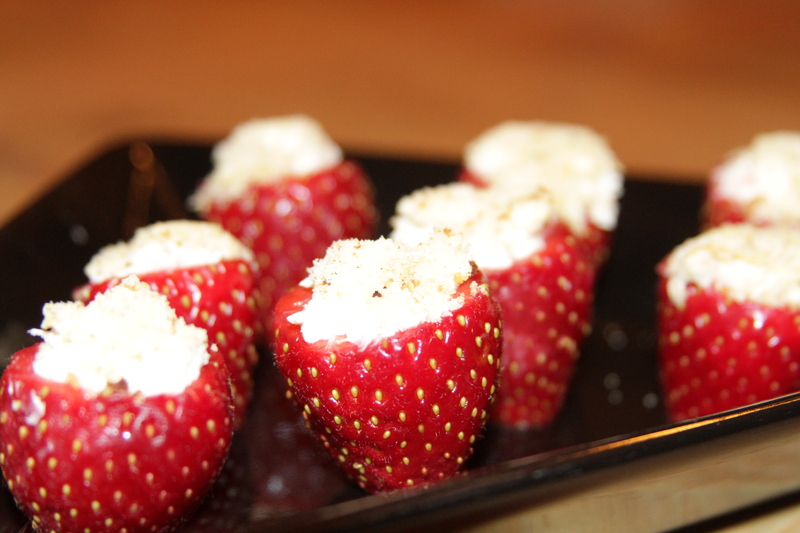 Dip the filled strawberries in the toasted almond flour. Refrigerate until serving. Can you substitute the Almond Flour for something else? One of my kids is allergic to nuts. great idea! Thanks! have a happy Valentines’ Day!